Eagles forward Adam Tambellini will have a quick turnaround after the end of the RBC Cup as he'll head to Toronto next week for the NHL's scouting combine. 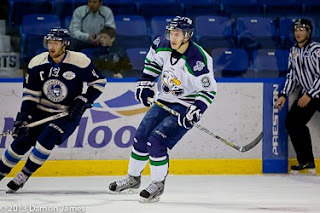 Tambellini was the highest ranked Canadain Junior A player on NHL Central Scouting's end of season prospect list. Forwards Adam Tambellini of the Surrey Eagles and David Pope of the West Kelowna Warriors will soon be headed to Toronto to be put through the paces of the NHL scouting combine. The event will take place May 27 to June 1 and the top 79 North American skaters, top seven goalies, top 14 European skaters and one European goalie will be there for a total of 101 athletes. Tambellini is listed at No. 42 for his group while Pope is listed at No. 67. Top-rated skaters Seth Jones, Nathan MacKinnon, Aleksandr Barkov, Jonathan Drouin and Valeri Nichushkin are expected to attend the combine as well. The 2013 NHL Entry Draft will be held on Sunday, June 30 at New Jersey's Prudential Centre.